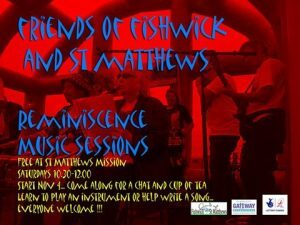 If you love music and want to get involved more in your community, FOFS are offering a series of music sessions you can attend. Starting from the 4th of November, they will take place at the St. Matthew’s Mission on Saturdays from 10:30am until 12:00 in the afternoon. Stop by for a chat or a cup of tea and get involved, there’s something for everyone! Whether you want to learn to play an instrument or you want to write songs, come along and have fun. If you have any queries, feel free to email us at fofspreston@gmail.com.